mommy's reviews: Colic Calm...The ANSWER for Fussy Babies! My baby Isaac is typically a very happy baby. He has been such a great baby when it comes to sleeping...much better than his brother and sister ever were. I have NEVER had a baby sleep for more than 3 hours at a time at night without waking up to eat. Isaac has been sleeping (don't hate me) for 6+ hour stretches at night starting from the time he was 2 weeks old. WOW. I feel so rested every morning, we rarely have a bad night. Sometimes though, during the day he gets fussy. If I eat something that is gas-producing, he gets gassy and fusses. What I have always used for my gassy babies are what I like to call "gassy drops". These are your typical infant gas drops that contain Simethicone. This remedy has always worked well but not to a point where I could say that I LOVED them. In fact, on some of Isaac's worst days (the days when I had milk to drink and it sent his tummy reeling) I was giving him these gas drops at least every two hours. I felt SO guilty giving him something that was totally unnatural, that I began to search for other options. There was one product that kept popping up into my radar during my Internet searches, that I began to contemplate if it would be worth a try. Colic Calm was spoken very highly of on just about every mom forum that I read. Moms were raving about it's ability to calm their colicky babies and soothe their gassy tummies. I also read that it was amazing at helping to get rid of hiccups...a common irritant for babies. Colic Calm Gripe Water, was developed by Jacqueline Lawrence in concert with a team of leading homeopathic pharmacists and doctors and is the only gripe water on the market which is also a safe FDA registered and regulated medicine. 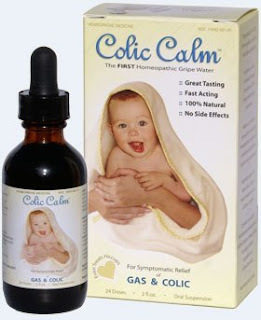 Since its discovery, Colic Calm has helped over 500,000 babies and has quickly become the leading natural medicine for treating the related conditions of infant colic, gas and reflux. Because of its low dilutions and 200+ year track record of safety, homeopathic medicine is particularly well suited to the treatment of children. Colic Calm was also featured in the most recent issue of “Family Doctor Magazine”, the official publication of the American Academy of Family Physicians (AAFP). Jacqueline Lawrence recently appeared on the the PBS show, Real Savvy Moms, to discuss the use of homeopathic medicines, such as Colic Calm, on children. Jacqueline now tours the country, putting allopathic and holistic health care professionals in-the-know about our growing family of products. My experience with basic gripe water has not been positive at all. It never worked with my daughter, who was the poster baby for colic. She was colicky no matter what I did. With Isaac, I was giving him Simethicone drops every 2 hours and it would not work all of the time. I was desperate. Sooo, after much research we bought our first bottle of Colic Calm. We found it at a local CVS drugstore and it cost $20.99. I was really shocked to see what this liquid looked like and was honestly slightly alarmed. This gripe water contains charcoal and so the color of the liquid is black. At this point in the game I didn't care and wanted to ease his tummy discomfort. Colic Calm was not instant relief for us...honestly. I read somewhere that it can take some time for it to work. Well, once it did kick in it was HEAVENLY. I would give him 1/4 teaspoon at night when I was trying to get him to sleep and he would drift off within about 15 minutes. He doesn't like the flavor at all and looks like "Really mom? This is what you are giving me???" Ha! But it is sooo worth it! I also discovered that it would stop hiccups! This is stated on the packaging but I didn't believe it...until I tried it. Within seconds of giving him Colic Calm, his hiccups were GONE. If you are a mom then you know how bothersome those nasty hiccups can be. One other GREAT perk was that it helped his bowel movements become more regular. Nothing else worked for me when it came to that and I was thrilled when his dirty diapers came more than once a week!! All Natural Ingredients: Chamomile, Caraway, Ginger, Aloe, Fennel, Peppermint, Lemon Balm, Vegetable Carbon. Black color can stain clothing...I use an old towel to help keep the liquid off clothing and blankets. Black color also turns stool darker than normal. Isaac doesn't like the taste. Price is a bit steep ($20.99)...but worth every penny!!!! I wasn't sent Colic Calm for this review but just wanted to share this great product with all of you parents out there who are suffering from a cranky baby. I feel like every parent should know about it. This stuff is amazing and I would strongly urge you to check it out. Like I said, the price is steep but honestly, it is SOO worth it! You can purchase from CVS stores or directly from the company. I wish I knew about Colic Calm when my first baby was born...now I tell everyone about it (including the first-time-dad-to-be in the car dealership waiting room!). Check it out TODAY! Believe me...it is wonderful! Disclaimer: I received no monetary compensation for this post. I purchased my own product...and conducted this review after using the product. Some images and quotes are from the Colic Calm website. All thoughts and opinions are 100% my own.